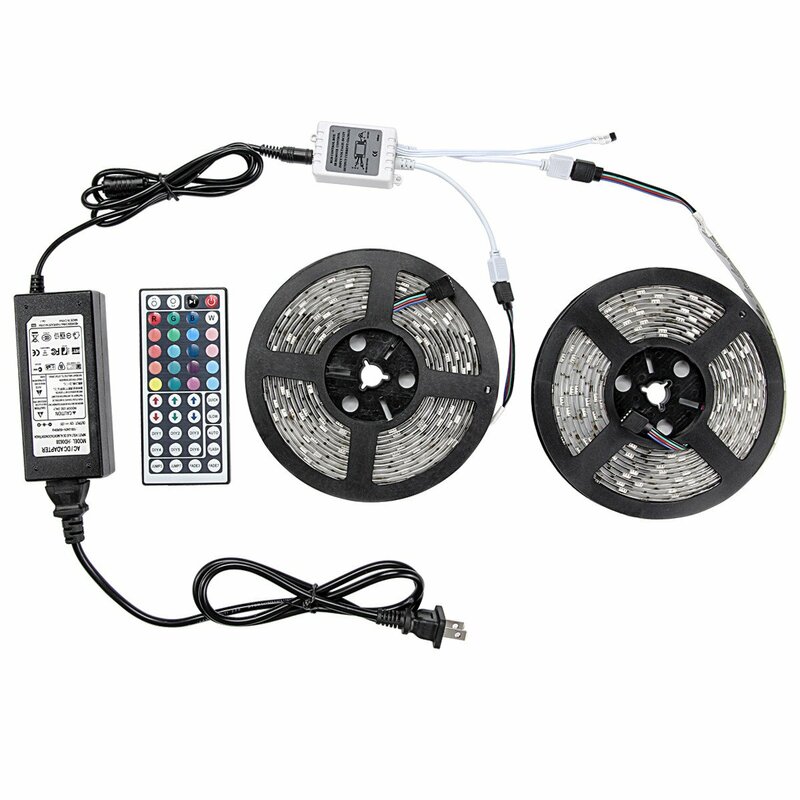 Home › Energy-Efficient LED Lighting › Wentop Led Strip Lights Kit Smd 5050 Waterproof 32.8 Ft (10M) 300Leds Rgb 30L..
Wentop Led Strip Lights Kit Smd 5050 Waterproof 32.8 Ft (10M) 300Leds Rgb 30L.. This is a standard kit. The adaptor only can load 32.8ft. Please don't increase the strip light. Come with RGB LED strips, remote controller, AC adaptor and connectors. No more accessories are required. 44key controller contained a DIY fuction , Press "DIY" botton and then just long press one of the arrow button to set it.Also it have dimming and brightness control. Cuttable and linkable. Color changing LED Strip Lights can be cut to every 3 leds, its 5M adhesive tape backing can be fit many dry flat smooth surface. Waterproof(not under water,but rainning) and Color changeable.Very suitable for indoor lighting and decor. Such as kitchen, under cabinet, dining room, bedroom, garden, patio, balcony, party, wedding etc. Remarks: If the power adapter or other accessories do not work, please contact us for help. Connect the load and power lines, make sure all connection right before power switched on; Insure there is no obstacle between the IR controller and the receiver when operating; Take off the plastic sheet of remotes battery before using. Features Continuous length, packed with 5 meter Cuttable every 3 LEDs along the cutting marks, according to requirement. Long life span 50,000+ hours Flexible ribbon for curving around bends Completely smooth and even light spread, solving the uneven luminous problem Ultra-bright but running at low temperature Low power consumption 44key Input voltage: 12V DC Max output current:12a Maximum output power: 72W Control mode:IR Dimming mode:PWM Output: 12V DC Connect mode: Common Anode Work temperature: -20~60 degree Control distance: 5m (must be a certain degree to aimed at the ir receiver andwithout any obstacles) Item color: White Shell material: Plastic Item dimension: 5.7 x 3.5 x 2.2cm/ (including 20cm/ 7.87in and 22cm/ 8.66incable) Remote controller dimension: 12.5 x 5.5 x 0.7cm/ 4.92 x 2.17 x 0.28in Item weight: 70g/ 2.46oz Package weight: 92g/ 3.24oz Power supply Output: 12V Input: 100-240VAC, 50/60Hz, 1.5A Power consumption: 72W DC port: 5.5 x 2.5mm (outer diameter and inner diameter) Adapter dimension: 104 x 50 x 30mm Total lenght: 230cm (including power cord) Weight : 272g Package includes 2 x 5M led strip light(waterproof) 1 x Signal receiver 1 x 44key Control board (with battery) 1 x Power supply Application Widely used for home decoration use, hotels, clubs, shopping malls Architectural decorative lighting, boutique atmosphere lighting Extensively applied in Backlighting, concealed lighting, channel letterlighting Emergency & security lighting, advertisement sign lighting Decorative lights for holiday, event,garden Applicable for automobile decoration, border or contour lighting Tips The connector between the light strip and ir receiver must be in towards thearrow.Please advise if you have question.